Daniel Vasilev Kostov, Georgi Kobakov, Daniel Yankov. Objective: One of the most feared complications after pancreaticoduodenectomy (PD) remains postoperative pancreatic fistula (POPF). 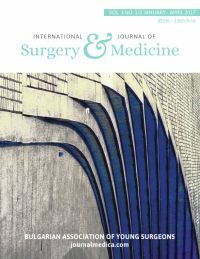 In the current study, we demonstrate a new technique for pancreaticogastrostomy (PG), using one continuous seromuscular circular suture without trans pancreas sutures for PG. Material and Methods: During the period December 2012 to December 2014, 32 consecutive patients underwent PD (either pylorus-preserving or classical Whipples) carried out using the above suture-less PG. Indication for PD was pancreatic duct carcinoma. Procedures were carried out by the same surgeon, same approach and anastomotic method in order to avoid technical changes. Results: Postoperative mortality was zero and morbidity was 21.8% (n=7). Pancreatic leakage (Grade A/B) occurred in 2 (6.2%) patients. These pancreatic leaks were managed nonoperative by maintaining the closed drains. The most common postoperative complication delayed gastric emptying (Grade B/C) in 3 (9.3%) patients. Conclusion: We conclude that the suture-less PG possesses several advantages over conventional PG and pancreaticojejunostomy (PJ). This technic seems to lessen the risk of a pancreatic leak, probably by diminishing the possibility of suture damage to the pancreas and by embedding the transected stump into the posterior gastric wall. This novel PG is a valid and valuable procedure, especially for soft, nonfibrotic pancreas. 4. Yeo CJ, Cameron JL, Sohn TA, Lillemoe KD, Pitt HA, Talamini MA et al. Six hundred fifty consecutive pancreaticoduodenectomies in the 1990s: pathology, complications, and outcomes. Ann Surg 1997;226:248-257; discussion 257-260. 6. Lermite E, Pessaux P, Brehant O, Teyssedou C, Pelletier I, Etienne S, Arnaud JP: Risk factors of pancreatic fistula and delayed gastric emptying after pancreaticoduodenectomy with pancreaticogastrostomy. J AmColl Surg 2007; 204:588-596. 17.Peng SY, Hong DF, Liu YB, Li JT, Tao F, Tan ZJ. A pancreas suture-less type II binding pancreaticogastrostomy. Zhonghua Wai Ke Za Zhi 2009;47:1764-1766. 18.Peng SY, Liu YB, Hong DF, Li JT, Tao F, Tan ZJ. PengÂs pancreaticogastrostomyÂcomparative study on types I and II procedures (with types III and IV appended). J Surg Concepts Pract 2009;14:5. 26.Hallet J, Zih F, Deobald R, Scheer A, Law C, Coburn N, Karanicolas P. The impact of pancreaticojejunostomy versus pancreaticogastrostomy reconstruction on pancreatic fistula after pancreaticoduodenectomy: meta-analysis of randomized controlled trials. HPB 2015;17:113-122. 27.Liu FB, Chen JM, Geng W, Xie SX, Zhao YJ, Yu LQ et al. Pancreaticogastrostomy is associated with significantly less pancreatic fistula than pancreaticojejunostomy reconstruction after pancreaticoduodenectomy: a meta-analysis of seven randomized controlled trials. HPB 2015;17:123-130. 31.Miyagawa S, Makuuchi M, Lygidakis NJ, Noguchi T, Nishimaki K, Hashikura Y et al. A retrospective comparative study of reconstructive methods following pancreaticoduodenectomy-pancreaticojejunostomy vs. pancreaticogastrostomy. Hepatogastroenterology 1992; 39:381-384.
International Journal of Surgery and Medicine 2018; (): 1. Is Sutureless Pancreaticogastrostomy More Effective than Single-Layer Duct-to-Mucosa Pancreaticojejunostomy in Pancreaticoduodenectomy? The Eurasian Journal of Medicine 2017; 49(2): 79-86.